Whirlwind! That is the only word I think creates an adequate description of my recent travels. Following my time in England I made my way to Arco, Italy, for the Rockmaster competition. It was sort of surreal to be part of such a legendary competition, so I had to make sure that I consciously took everything in. Despite not making finals I thoroughly enjoyed my time in Arco, but in all honesty how does one not enjoy their time in Italy? Lake Garda seemed to be the site that everyone who found out I was going to Arco seemed to suggest I go see. I have to say the way everyone described the lake still didn’t do it justice; it was absolutely breathtaking. In addition to the beauty that I was constantly surrounded by in Arco was delicious the food and coffee. I am not sure I will ever enjoy pizza from the US again, because the pizza I had was phenomenal, thinking about it right now is making me sad knowing that I can’t have any. I also find myself constantly trying to make or find a cappuccino as good as the ones that I got in town multiple times a day, for the 3 or 4 days I was there, but alas my cappuccinos are no match. I am constantly telling people that one of my favorite things about Italy is that at anytime during the day you could see someone walking with gelato. That little fact was amazing because I never felt like it was too early or too late in the day to indulge in some delicious gelato. I think I had so much nutella gelato that I don’t need to have nutella for about a year. Lake Garda off in the distance between the mountains! Following Arco, Alex and I took an impromptu trip to Innsbruck, Austria. Innsbruck seemed like the best place to go for a few days before heading to Stuttgart, Germany, for the Adidas Rockstars competition. The time I spent in Innsbruck was quite relaxed and really fun. It was nice to be able to go to Tivoli and get a couple of training sessions in before the Rockstars competition. Unfortunately, I may have climbed a bit too much, but you live and you learn. The mountains that engulf the town are absolutely gorgeous, and as I walked, shopped, and ate in the city center I kept wishing I had more time to spend there. All of a sudden my couple of days in Innsbruck were up and I was off to Stuttgart! Prior to my arrival in Stuttgart I had heard from many people that the Adidas Rockstars competition was one of the best competitions they had ever been to. 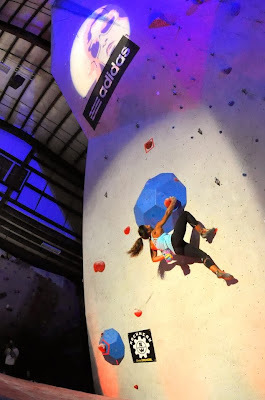 Not only was the competition itself a lot of fun, but also the overall experience was described to me as one that made climbers feel like the professional athletes that we are. To my satisfaction the competition lived up to every tale I had heard and more, my 14th place finish was a little bonus to the experience. Everything from the hotel, transportation, massages, and amazing food to the giant arena, great boulder problems, and excited fans was amazing! 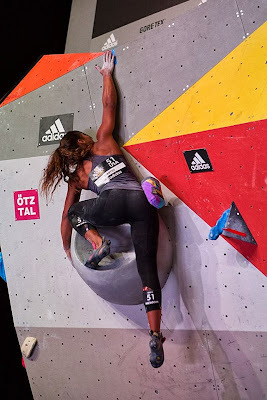 In my opinion, the Adidas Rockstars competition is in a league of its own as far as competitions go. Qualifier 1 at Adidas Rockstars! After Stuttgart I returned to Boulder, Colorado, for a few days to move into my new apartment, and to try to help some of my friends affected by the flood. I almost felt guilty for being away from something that was so devastating to my community, but I am looking forward to being back there and helping out as much as I can! I basically unpacked and then repacked my bags to head to Boston for the first ever women only competition at the Central Rock Gym Watertown called The Heist! I have to say I am so honored that I was able to be part of such a revolutionary competition. When I heard about the competition I was 100% in from the start! Not only did I think it was a great idea, but also a couple of my favorite ladies (Andrea Brennan and Brittany Marryiott) organized the event. The competition was definitely a great success, and I was psyched to have my Rockwerx family at the competition to cheer me on!!! I ended up taking 6th place, and even though I didn’t have my best day of climbing, it was impossible to be unhappy. Since I was in such a fun and supportive atmosphere with many of my closest friends, I just couldn’t seem to stop laughing and smiling! The following day I taught two bouldering clinics and prior to teaching them I was extremely nervous. Looking back I can’t believe I was so nervous since I had such a fun time in both of my clinics! It seemed like everyone enjoyed it and learned a few new things, which is all I could ask for! When it comes to competitive sports it is sometimes difficult to remember that the goal is to always have fun! There are definitely moments where all you want to do is crawl into a hole and die, but at the end of the day climbing is one of the most amazing sports and we are all so lucky to be a part of this sport. So why not focus on the fun that comes with climbing and just keep smiling!